Tri-Arc’s steel rolling ladders are the leading choice among ladders needed in all types of environments when working from height both safely and productively are essential to the job. The ladders are available in a wide range of sizes to accommodate the varying needs of height in the work area. Choose from either perforated or grip-strut tread designs based on the environment in which the work will be performed. All of the models are equipped with hand rails and guardrails to provide the safety and comfort when ascending, descending and performing work from the ladder. 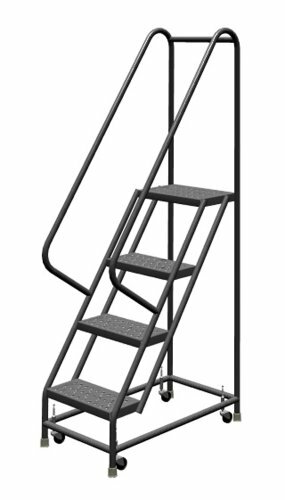 The Tri-Arc Steel Rolling Ladder model is engineered and manufactured in compliance with OSHA 1910.29 and ANSI A14.7 standards. Some additional features include gray powder coated paint finish, 16” Wide steps (3 – 4 step models) & 24” wide step (5 – 15 step models), spring-loaded casters (3-5 step models) and positive locking system (5-15 step models), and 10” deep top platform . Rated capacity of 450 lbs. and made in the USA.